Smart brands convey a strong, overt benefit that lines up with people’s actions and beliefs. Great brands, however, are smart enough to see the gap between people’s actions and beliefs, and leverage it for greater opportunity — and they do it without you realizing. Cognitive dissonance occurs “when your ideas, beliefs, or behaviors contradict each other.” If you think you’re financially responsible but then feel guilty spending $400 on a new pair of shoes, you’re experiencing the weight of cognitive dissonance. When you buy a new computer but look up reviews and prices afterward to convince yourself it was a smart purchase, the stress of cognitive dissonance is driving your behavior. You can return the $400 pair of shoes, or you can keep them and tell yourself they’re handmade in Italy and will be a wardrobe staple for years to come. You can search and search until you find a better computer at a better price, or instead comfort yourself in the changed belief that it was a good investment and what really matters is that you no longer have to worry about your programs constantly crashing. If you’ve ever bought an expensive luxury item or untested piece of hardware, you’ll agree that none of those options ever feels quite right. Either by lack of information or lack of self-control, there is a measurable discomfort we feel when what we believe is not synonymous with what we do. Cognitive Dissonance Theory explains how that mismatch drives our behavior… the urge to pacify and rectify ourselves, even when no one is watching. Depending on the situation, you’ll go for one, two or all three of those options in relieving your state of cognitive dissonance. Most of us think we’re honest, but call it a “fib” instead of a lie when we act dishonestly in an awkward situation. Calling it a fib lowers the tension between believing we are good, honest people, and the fact that we failed to tell the truth. 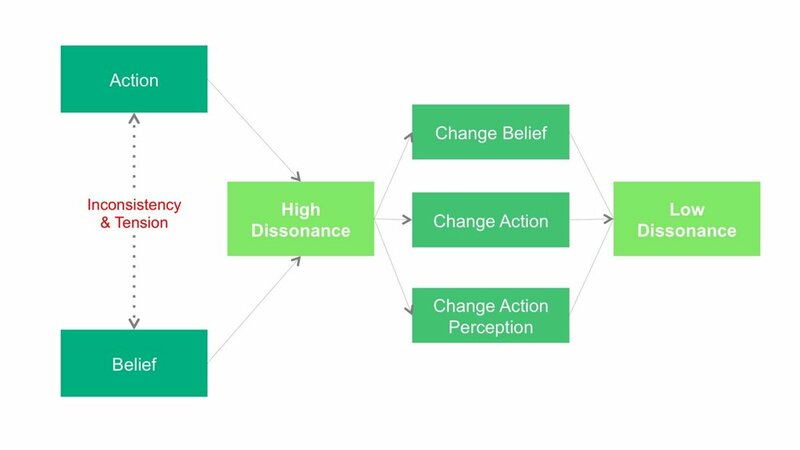 Cognitive dissonance plays many roles in our lives, ranging from self-denial to simply getting through the day. By the way, it’s everywhere. We have all kinds of conflicting desires and beliefs, not to mention outside influences, internal biases, and the fact that the expectations and restrictions placed upon us change in different environments. From the time we’re kids believing (but not really believing, but maybe kinda believing) in Santa Claus, to being teenagers who convinced ourselves we “like, omg, really loved prom” even though it sucked and was nothing like the movies we grew up with, to being adults who cheat on our diets because we can always jog for an extra 30 minutes tomorrow… it’s a part of life. A good brand will address subconscious drivers like these, and any company that makes it easy for a consumer to narrow the gap between what they believe and what they do will tap into a viable market opportunity. They will create a product that makes it easy to change your behavior (Any.do, Wunderlist), or a story that makes it easy to change your beliefs (Starbucks, Supreme). Either way, your actions will match your words. …but there are some brands that let you have your cake and eat it, too. They covertly allow you to maintain your current behaviors, but reap the rewards of lowered cognitive dissonance. These are the brands I find the most interesting. A lot of startups have tried to solve the personal finance problem. Companies like Mint and LearnVest help you manage your budget by hooking up to your bank accounts and giving you transparency into your spending habits. The more you know, the more empowered you are to maintain and follow a plan that will turn you into the financially responsible person you believe you are. The cognitive dissonance here is that many people want to believe they are smart with money, but oftentimes their actions prove otherwise. It can be a very emotionally taxing dissonance for some, so Mint and LearnVest have created products that change the behavior to be closer to the belief. Digit, however, realized that for a lot of people, transparency wasn’t the issue. It was the behavior itself. Changing that action is incredibly difficult for most people because they overspend for a variety of reasons that have nothing to do with transparency, including overwhelm, emotional spending and personal attitudes toward money. Digit silently siphons money from your checking and savings balances every week into a separate account for safekeeping. You can “save money without thinking about it” because Digit sets aside money “in a way that you won’t notice.” In six months, you can be surprised to find out you have enough cash to take a trip to Europe or put a down payment on a car. You maintain your spending behaviors, and still reap the rewards of lowered cognitive dissonance... a very attractive promise that Mint and LearnVest fail to offer. Instead of a changed action, you have an adapted one that is far easier in practice. Let’s think about another strong point of dissonance — charity. I’m not convinced anyone has permanently cracked this nut, but there have been a handful of brands who hacked cognitive dissonance in order to make charity happen where it might otherwise not have. The gap is a) we believe ourselves to be charitable, kind, generous people, but b) we rarely give to charity. Standard practice here is to change our beliefs. Can you really trust a charity to not be corrupt? Is there a charity for a cause that I’m truly passionate about? Will my $5 even make a difference? It’s a dollar, and it’s a yes or no answer. Dead simple with virtually no significant cost to you. But you likely said no. You might be the same person, however, who said yes to a “Buy One, Give One” brand like TOMS or Warby Parker (although Warby Parker takes a slightly different take on the concept.) Although it was far more trendy just a little while ago, Buy One, Give One is still a huge force and was woven into the very fabric of a brand like TOMS. We tend to behave selfishly. It’s hard to give without getting something in return. TOMS let’s us give in the name of receiving every time we buy a pair of shoes. You maintain your self-centered behavior, and still reap the reward of lowered cognitive dissonance… another very attractive promise that your checkout attendant simply can’t give you. Brands like these relieve you of lower feelings such as guilt, worry and even shame, without ever saying it out loud. That’s why they have the potential to be so powerful. It can be your product, your story or your user experience — all touch points are levers for easing the discomfort and helping people reinforce their view of who they are in the world. When Stephen Dorff created a national wtf moment with his blu e-Cigs commercials, he was enacting a very deliberate campaign to reduce the huge cognitive dissonance existing in the minds of most smokers. With stakes that high, a brand has to work on multiple fronts. When a behavior and belief stand in such opposition to each other, amplified by immeasurable public pressure and negative stereotypes, there is huge opportunity to reduce cognitive dissonance for your core audience. blu could have just conveyed a more socially acceptable product, which was at the time supposedly deemed 95% safer than smoking regular cigarettes and posed far less risk to others through secondhand smoke. In fact, according to the brand, it allowed people to “enjoy smoking without letting it effect the people around me.” That would have been enough to adapt the action for many smokers. It gave you permission to smoke, and not feel so bad about it. But the behavior of smoking itself has such a deeply ingrained stigma, they knew they had to take it one step further and change the action perception as well. Those are fighting words. Those are words that make it ok to be a smoker… words, I’ll add, that smokers never hear. It flipped the script and said you’re not the bad buy, you’re the victim. You don’t deserve to be vilified. A new behavior coupled with a new narrative can be very strong, especially with marginalized groups. blu understood that and eased the intense cognitive dissonance smokers feel every day — something that would resonate with both casual smokers and life long addicts. Brands that play cognitive dissonance often channel it as ‘permission’. They make it ok to stay the way you are, while reducing the emotional friction. You can use it for good (finance, charity) or not so good (cigarettes). What’s worth noting is that generally speaking, different levels of dissonance create different factors. Common overspending is often a punchline or the subject of a meme, while smoking doesn’t afford such light discourse. Political and religious ideals often require us to hold steadfast to one-sided arguments in order to resolve factual disconnects, but sneaking a slice of cake and moving your diet start date to tomorrow doesn’t summon the same sense of urgency. Of course, there are some caveats to this, including the fact that different people feel different levels of dissonance on the same topics. It’s been found that extroverts are less likely to feel negative tension and less likely to change their minds than introverts are. We also have to keep in mind that different cultural backgrounds, genders and socio-economic status play a role, too. Say you’re a student applying to two different universities and you rate each one before sending in your applications. You’re accepted to both schools and after some deliberation, choose the right one for you. If you were asked to rate those same schools again after making your choice, you’d be likely to give a higher rating to the one you chose, even though nothing about that school has changed. We have a strong compulsion to prove to ourselves that we make good decisions. Even after the fact, we will continue to search for proof that we were right. Many brands facilitate your ‘proof-searching’ so you can feel good about the purchase and feed the positive cycle. Amazon’s weekly emails to Alexa users not only keeps them informed of Alexa’s new skills, but also protects against buyer’s remorse when users fail to immediately find the skills that would make it most useful to them. Washio (R.I.P.) used to pacify my guilt with a special reward. Every time someone would come and pick up my laundry, they’d give me a tiny sample pack of the most heavenly dessert from DeLuscious. I’m not joking, it was unreal. I looked up their brownies to buy some for a party and they cost over $60 a dozen (!) Needless to say I didn’t make the purchase, but I can tell you that my crippling guilt over wasted money on laundry (that I really should have been doing myself) washed away when I got that brownie. Gusto sends business owners a hearty congratulations every time payroll has been paid or tax forms have been filed. Keep in mind that a business owner isn’t actually doing that work. Gusto has automated both of those processes, but deliberately gives the pleasure of a reduced cognitive dissonance to the customer. Cognitive dissonance isn’t behind every brand, and it won’t apply to every founder or executive, but you will run across it at some point, whether it’s in marketing, user experience or attracting new demographics. If it does apply, here’s how to start using these principles for your own company. If you want to be good at spotting it for your brand or product, look to yourself first. Cognitive dissonance can be easy to miss. It’s subtle and insidious by nature, and can take many forms. It’s easy to mistake it as ‘friction’ or a ‘pain point’. In fact, I was inspired to write this piece because something strange happens to me when I travel. I find myself in heated political discussions with people in other countries, and have a near out of body experience when I suddenly realize that I’m defending a point of view that I wouldn’t normally hold in the United States — especially if the other party is being critical of America, American values, or its citizens. Some of that is an immature, knee-jerk reaction to feeling personally attacked. Some of it is my desperate need to move away from divisive, anxiety-inducing language to something more constructive and less apocalyptic. But a lot of it, I’m realizing, is actually cognitive dissonance. There is a measurable difference between my conflicting beliefs, and it plays out in my actions. Start by examining yourself and the people around you for a few weeks. See if you can surface dissonance in their actions and ideas, and figure out where the tension is coming from. What secret beliefs do my users hold? What makes my users nervous? Is there a driving emotion underneath each pain point? Look for the gap that shows a misalignment. That gap will lead you to the core of your brand. Ask yourself: Can I change the story? Can I change the behavior? Or can I adapt/ “cheat” the behavior? Nabisco couldn’t turn their sugary snacks into a diet food, but they could cheat the concept with 100 calorie packs that let people think they were changing a behavior to match their beliefs, relieving them of the cognitive dissonance… even though they weren’t entirely practicing healthy eating like an actual health food would require. That was bolstered with carefully balanced marketing that promoted the changed belief that portion control is all it takes to make Oreos or Chips Ahoy! part of your diet. This is where the artistry and science of brand strategy comes in. Depending on your approach, you’ll have to adapt your product development, brand narrative and any number of factors to beneficially leverage the dissonance for your consumers. A good place to start is to look at other brands (much like the ones I’ve outlined in this piece). See how they’ve done it and how you can apply the same approach to your brand challenge. In the larger scheme of things, we already know it’s important to give our customers a sense of agency. We know that reducing friction (experiential, emotional or otherwise) is crucial. And we know, above all else, a successful brand makes people feel good. If you really want to hit the emotional triggers that make people trust and value a brand, you have to go deeper than the problem on the surface. You have to dig until you find the discrepancy — the gap that needs to be fixed — and resolve the tension. That silent relief is the hidden key to winning your target.